Things are going good for me. Things went very well for me today. I'm looking foreword to getting back to work and my daily routine. I am a man with pretty tight daily schedule. I don't like things changed at all on a day to day basis. Debbie thinks I am pretty rigid and I tend to agree. It helps me feel better when everything goes according to plan. I know this sounds funny, but I like to vaccum to relax if I am feeling anxious. It helps me feel calmer, less angry and more in control. I am going to get alot of sleep tonight and rest. That helps alot too. This afternoon I worked at the Kip Gross, Battle of the States Charity Golf Classic, for the Moreno Valley Morning Optimist Club. I was stationed an extremely windy and cold hole, giving out poker cards and snacks. It wasn't too bad since I met alot of really nice people. I didn't get a chance to listen to much of the service today and I really miss not being able to focus on what is being said. I'll have to check out the podcast during the week and make sure that I keep current. Izzy looked really cute this morning and I really had a good nights sleep. I picked up Debbie tonight from the airport. She's been gone all week in Tucson, AZ. for business. It's nice to have her home. Maybe I can get a chance to relax and take it easy for a few hours. Hey it snowed today! Izzy, Britty and I went up to Oak Glen on the way home from Yucaipa. I'd like to see more about the iPhone. I've about had it with this Motorola Q. I have it working again after a firmware upgrade. Now just some fine tuning. It's a better day for both Izzy and I. I feel much more relaxed and happy to be spending time with her and it seems like she's much happier also. We went for a nice long walk this morning, but didn't stop at the park, it was too cold and windy. It snowed last night in the mountains above us and it is supposed to get even colder tonight. I don't mind the cold at all, but I need to make sure my baby is all bundled up. She's done for a nap right now and I get a chance to unwind and relax. Not that it's a bad thing to be with her, but she's always on the move and that's alot of work to keep up. Hopefully the rest of the day goes as well as this morning has and we can all have a goodtime. I won't be able to go to my meeting tonight which is a drag, but next week I'll make sure I attend. Debbie is still in Tucson and I miss her alot. I just don't sleep well without her next to me. I'm going to go take a nap now and rest. My male Minpin. I've had him since birth. He's 13 years old now. He's very good with Izzy and is very attached to Debbie. I had a rotten day with Izzy. I was trying to get some things done around the house and everytime I started it seemed that she wanted attention. I really don't blame her, she's only a baby. I have this crazy desire to get things done. So I got frustrated and angry with her an just was a jerk. I really regret my poor behavior. I guess I'm not perfect, but I want to be a good dad and it really upsets me when I blow it like that. I need to focus on her and not on stuff. Well I'll have to try harder. Kiwanis went well tonight and I took Izzy since Britty had alot of homework to do. She was great and didn't cause a fuss. I did a short presentation on recruiting, that went well. Izzy went right to sleep when we got home. Nothing but trouble. Looks good, runs poorly. The piece of junk is still giving me problems even after three replacement phones. The Windows Mobile 5 operating system that Motorola hacked up for the Q is a complete nightmare. I usually have to perform three or four soft resets a day and restart the phone three or four times. I just would buy anything with Windows Mobile 5 on it and most certainly not a Motorola Q. Verizon has been extremely nice and replaced each phone but after the 1 year warranty is up, I know I'll be buying a Blackberry. The hardware is fine and the phone just looks good. When it works it's a great phone. But it just doesn't work very often. Debbie is gone for the entire week to Tucson, AZ for business. I hate her not being here and beside me at night. I don't like being alone. I just received my beta invite today. Installed it without a hitch and so far so good. Quote from the Venice Project site, "A project that combines the best things about television with the social power of the internet - a project that gives viewers, advertisers and content owners more choice, control and creativity than ever before." 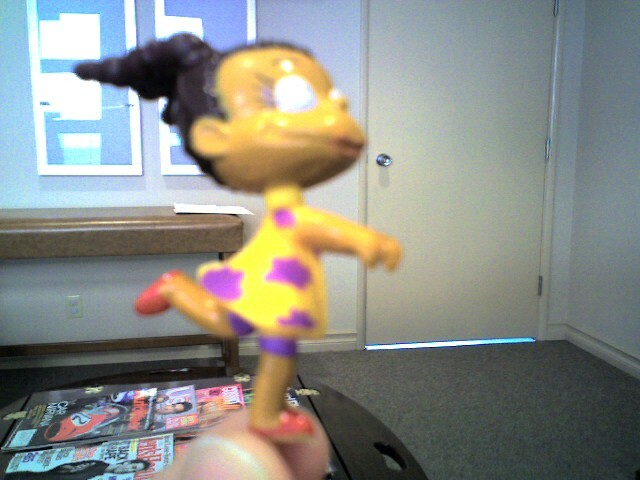 She looks just like this running down the hall. Just a slow day with not a whole lot going on. Went for a walk and played with Izzy. She sure has alot of energy. Debbie is leaving for a week in Tucson, AZ, Monday morning. No rest for me. Our next door neighbors daughter had her 5th birthday today. Izzy, Debbie and I went over and had a really nice time.